Since the 1960s, the literary critic Harold Bloom has been producing some of the most powerful criticism in the United States. This large body of work has, since the publication of The Anxiety of Influence in 1973, increasingly distanced itself from all critical vogues, be they psychoanalytic, post-structuralist or new formalist, in favour of a highly idiosyncratic poetic theory. First published in 1988, this title was the first to engage with this unique approach in order to extend and amplify its most crucial insights about the nature of rhetoric, as it functions both in poetry and in poetic theory. 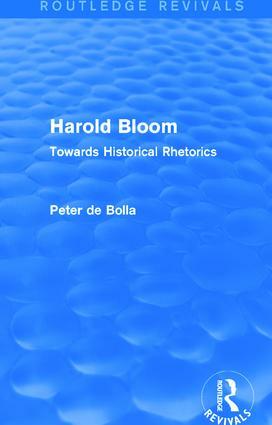 The underlying argument is for a historical conception of rhetoric, for an extension of Bloom’s ‘diachronic rhetoric’ towards historical rhetoric.